Matthew Bomer is flying high these days. Literally. This month the Spring, TX native stars with Jodie Foster in the new film, Flight Plan. From shooting the television series Tru Calling in Vancouver, to his film work and all the way to the Broadway stage, he seems to be making all the right moves. Now, he’s starring in the USA Network hit, White Collar and taking the world by storm. Here he reveals what it’s like to have a Dallas Cowboy football player dad, going to high school with movie stars, and maybe playing a superhero in the future. Lance Avery Morgan: Flightplan looks like a great thriller. Without giving anything away, tell me about why the movie is going to be a big hit. Matthew Bomer: Part of its success is that it plays on our fears, which Hitchcock did so well. Plus, I got to work with producer Brian Grazer, which can be a little intimidating. I admire his work so much. LAM: Speaking of big talents, what was it like to work with Jodie Foster? MB: We had a blast. It was a great experience for three months. Eighty five percent of the movie takes place on an airplane, a set that looks like the new Airbus. Jodie is amazing. A really incredible person. Peter Sarsgaard is great to work with, too. LAM: Tru Calling seemed like a cool show to act in. What was the best part of it for you? MB: The best part was that there were the wonderful people to worked with behind the scenes, as well as in front of the camera. And then there was working with Eliza Gilkerson – really great. Plus, I got to live in Vancouver. So beautiful, but bad drivers. 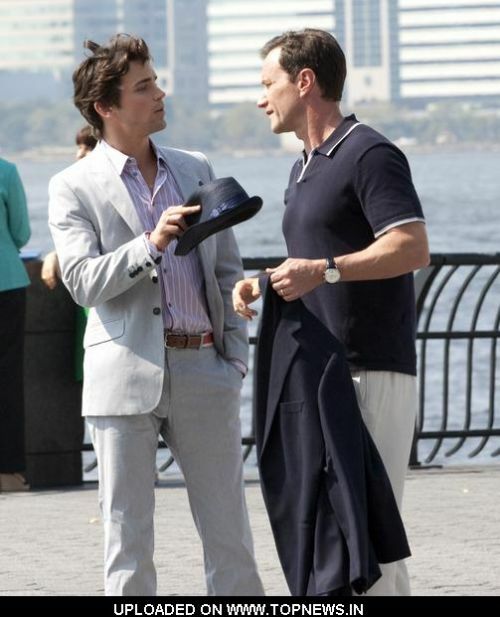 LAM: Your dad, John Bomer, is a former Dallas Cowboy star. Did you play a lot of sports growing up? MB: Oh yeah. We were always throwing the ball around. I played everything football, track, and to be honest, I was only pretty average at all of them. I loved living in Texas – the people, the manners, gentility – and great cooking at my grandmother’s. LAM: So many famous people have come from where you grew up in the Houston area – Rene’ Zellwegger, Jaclyn Smith, Dennis Quaid. Is it something in the water there? MB: It’s crazy, isn’t it? There’s also Lynn Collins (Merchant of Venice) and Lee Pace, who is an actor nominated for an Emmy for Soldier’s Girl. As you know, coming from Texas is like coming from another country. There’s a sense of community. Plus, being a Texan also breeds a healthy sense of competition, which helps if you pursue life in the big city. LAM: Was it a shock going from small-town Texas to the Big Apple? MB: I went to college at Carnegie Mellon, so from Spring to Pittsburgh was a bit of a departure. I’m thankful to have done that first. New York is so wonderful. You walk out the door and there are millions of people doing different things, so it tends to open you up as an individual. LAM: I heard you were one of director Brett Ratner's favorite choices to portray Superman/Clark Kent in the upcoming Superman movie. Do you want to play a superhero in your career? MB: Hey, as long as there’s criminal activity in society, there’s a need for superheroes, don’t you think? And yes, it would be great to play one sometime. LAM: What is your favorite thing to do these days to unwind from your acting schedule? MB: I do yoga. I’m a bit of a homebody. I like to keep it low key and grab a drink with friends. I go to the gym and I also like to play poker. My latest thing is Frisbee golf – which I started in Austin. LAM: Any advice for those seeking the bright lights of acting? MB: Look, I’m a kid from Spring, so I believe no matter where you are, you can do it. Find the path to be a working actor. You have to have a mission statement for yourself.